DVD Synopsis: They were goldbricks until they found out about the gold bricks – a fortune in Nazi-confiscated bullion! Clint Eastwood reups with the director of his Where Eagles Dare for this alternately action-filled and tongue-in-cheek tale of GIs who decide to get something extra out of the war. Eastwood, North America's #2 box-office star at the time, plays Lt. Kelly, mastermind of a scheme to slip behind enemy lines and steal the loot. Co-stars include a trio on the verge of big-time TV success: Carroll O'Connor, Telly Savalas and Gavin MacLeod. Plus, Don Rickles plays the expectedly outspoken Crapgame. And in the same year as his starmaking M*A*S*H, Donald Sutherland is Oddball, World War II's only hippie. Dig it! Kelly's Heroes is chock full of strange characters, and among the strangest is the aptly-named Oddball (played by Donald Sutherland), a highly-skilled tank commander who's also some sort of an early hippie, professing love for his common man and harboring a strong belief in the power of positive thinking. Oddball is not the type of character you'd expect to find in a World War II film, but then Kelly's Heroes is not your typical action-packed war story. It is is an entertaining clash of cultures, a World War II movie with a distinctly '70s mentality. Battle-hardened veterans Kelly (Clint Eastwood) and Little Joe (Telly Savales) join forces with Oddball and Crapgame (Don Rickles) to push 30 miles into enemy territory, where they hope to steal a fortune in gold that the Germans have stashed inside a small French bank. The film does contain a few exciting sequences; in the opening scene, Eastwood's Kelly is driving a jeep, as well as a newly-captured German officer, through a barrage of mortar fire. And what sort of music fills the soundtrack as he makes this daring escape from the enemy? Is it the booming sounds of an orchestral score, like you'd find in most war films produced around this time? Nope. As Clint drives along, avoiding one explosion after another, we're treated to a little number by the Mike Curb Congregation titled “Burning Bridges”, a song that bears the unmistakable tone of the Love Generation. It's yet another example of the marriage of two time periods that's featured throughout Kelly's Heroes, and what's truly surprising is how well they blend together. 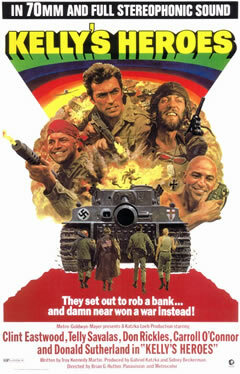 With comedy and action aplenty, Kelly's Heroes is a very fun - and very funny - movie. i saw this when it came out, in a little theater in Los Alamos, with a friend who was a tank expert. since the movie includes a lot of U.S. and German tank action, I got an earful all the way through. don't remember anything that i was told except that the German Tiger was a superior vehicle. I believe they make reference in the movie as well that the Tiger is superior (Oddball pretty much says he would have never signed on had he known he would have had to go up against Tigers). That said, I would have loved seeing this one on the big screen. I'm jealous! Hey Fred! Thanks for stopping by. It's a very, very funny movie. Can't say it's one of my favorites, but it's certainly one I'll sit down and watch whenever it's on. I've seen this movie on television so many times over the years - but have yet to watch it on any home format. One of these days i'm going to purchase a copy on DVD/Blu Ray. It's been some time since i've seen it - I hope i'm not disappointed with it (as one tends to be with movies that we thought were great years ago). @Klaus: I'd be very surprised if you're disappointed. The film holds up well, and is still very funny. I have it on good authority that John Landis was an assistant director on this, meeting Oddball himself, Donald Sutherland. Which led to a favor being called in so that when Landis directed Animal House, Donald Sutherland appears in that, his part being filmed over the course of 2 days! And that's one to grow on! @Matthew: Thanks for stopping by, and for the comment! I LOVE this movie too! Rickles is great, but Sutherland's Oddball will always be my favorite character ("Enough with those negative waves, Moriarty"). Carroll O'Conner is also pretty funny in his limited role. And that's really interesting about ANIMAL HOUSE. I knew John Landis had worked as an assistant on this film, but I never made that connection. Great stuff...thanks for that! I've seen Sutherland in three war flicks; in The Dirty Dozen, he's a dufus; in Mash, he's a funny, but skilled surgeon; and in Kelly's Heroes, he's back to being an Oddball. All wonderfully done. Love this movie. One question, though. What do the heroes do with the gold? That could have been a sequel.